I’m really liking the SIII MMD 20x42mm. IF they come with a reticle that doesn’t cover the center of say, a 1/2 MOA F-Class target center, they may be on to something, filling a gap that the Super Sniper scopes have left laying out there. So far Sightron’s website seems a bit confused as to what the reticle dimensions actually are… for the 16x it gives no dimensions, for the 10x it says ‘NA’ and for the 20x it says the dot in the middle (the reticle pictured varies considerably from the one shown for the other 2) measures 3.6 *inches*. Hopefully they get that straightened out – otherwise very nice looking scopes! The specs say that a sunshade is not included. Hopefully one is available. If so, I wonder what the cost will be. I agree witht the first comment; SIGHTRON really needs help with their website. I like the fact that Sightron is listening to their customer. They have added different reticles, added 1/8″ as a turrent option and built a scope with higher magnification, all things shooters have requested on this site. Savage arms is another firearms related manufacturer that comes to mind which strives to meet customers’ requests. These companies are what this sport is all about, refinement and continuous improvement of shooting gear for better precision/accuracy. Who else but benchrest and target continue to demand these innovations? 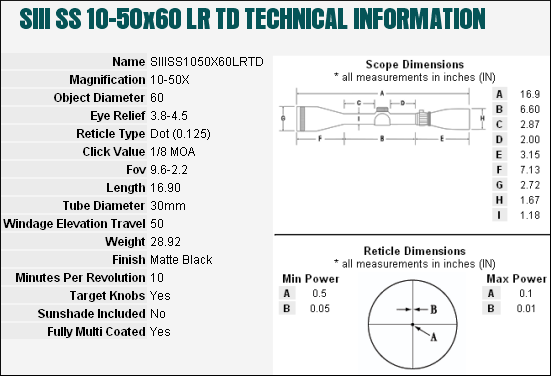 I hope Sightron will have 1/8 MOA per click adjustments on their 8-32×50mm LR SIII model. 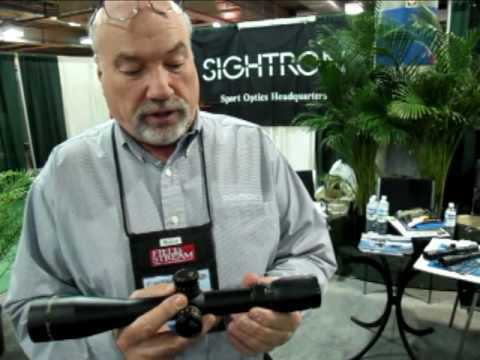 Rudy, If I read the Sightron web site correctly the 8-32 will have the 1/8″ option. I hope they come up with the option of custom tactical turrets like leupold. There is going to be a Sightron in the near futur for my 300 wsm that I am putting together.